How does religion affect the Bhutanese people’s daily lives? Some say that “If you didn’t go to the Eiffel Tower, you weren’t in Paris.” In the mountainous, mysterious country of Bhutan, they say that “If you didn’t go to Tiger’s Nest, you weren’t in Bhutan.” If you’re wondering, Tiger’s Nest is a monastery located on a clifftop 3100 metres above sea level. The hike there is 4 hours up, 3 down. It’s definitely not like the Eiffel Tower. This only showcases a small part of the reverence the Bhutanese have for their many, many monasteries hidden behind tree-topped peaks, and rock faces thousands of metres high. The Bhutanese people believe in Mahayana Buddhism, the type of Buddhism that dominates central Asia, but these mountain people have added their own twists and created their own legends, centuries-old tales that have been sheltered by the protective walls of the mountains, and kept safely in the rural towns and villages ensconced in trees. and still take part in Bhutanese people’s daily lives to this day. In fact, Bhutanese people are always free to visit the monasteries, (well, during visiting hours, that is) and many often do. According to our guides, on weekends and holidays it is very common for people to visit monasteries to meditate and/or pray. When faced with the large, usually bronze statues of the Buddha, they press their palms together above their forehead, in front of their lips, and to their chest, each gesture in succession, and then bow down to worship the large, majestic statue in front of them. They also believe in gods, and oftentimes beside the Buddha you will see smaller (but still impressive) statues of various different gods. Some temples contain statues that represent the Buddhas of the past, present, and future (the present being the main statue in the middle), and others depict gods of longevity or important deities that vanquished demons. 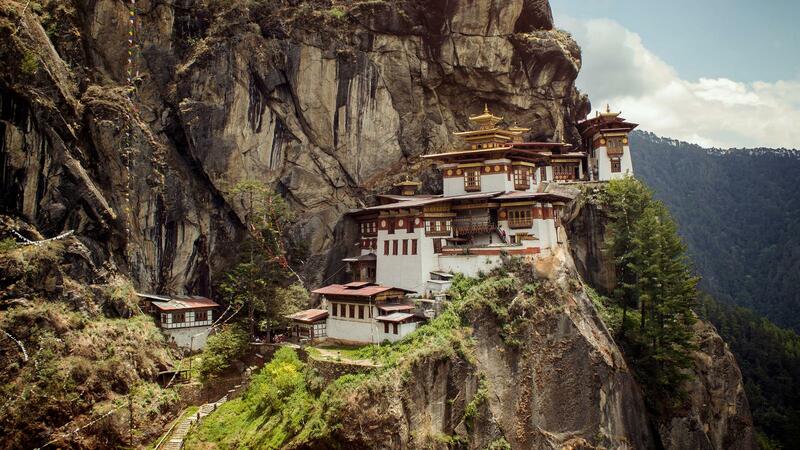 Tiger’s Nest, arguably the most famous monastery in Bhutan, was built for a man who rode to the cliffside on a flying tiger, to fight a demon that was terrorizing the people. People can even visit the temples and monasteries where the King holds his court. Yes, Bhutan is governed by men sitting inside the walls of monasteries, which once again showcases the importance that Buddhism has inside Bhutan. Every major monastery, or dzong, holds a big festival for one selected month of the year, where music, dance, and drama take place to teach the people about Buddhism through legendary myths. Thimphu, the capital of Bhutan, has its festival during September, and all the 100,000 people living there come to Thimphu-dzong to celebrate and learn about a religion that has infused Bhutanese culture for the ages. However, religion and culture in Bhutan is not all song and dance. It would be untruthful for me to report that the culture in Bhutan wouldn’t offend many people. It can be extremely sexist. The following example describes a central legend in Bhutanese culture, and I say now that some may be affected deeply by these next few paragraphs. Now is the time to look away, if the issue of consent triggers you deeply. One of the most common Bhutanese myths involves a ‘divine madman’. In Eastern Bhutan, young men take the stories of this ‘divine madman’, who was a great mythological figure that lived thousands of years ago, and then translate them to their own lives. The ‘divine madman’ was thought to be mad, as his name suggests, as he taught Buddhism in a way the Bhutanese people had never seen before. According to the stories, the ‘divine madman’ subjugated a fearsome demoness, and taught Buddhism using his three values. Unlike most stories, he did not value purity, honor, or anything of the sort, no, he valued women, alcohol, and the phallus. This is why the Bhutanese thought he was mad. However, the stories of his escapades involve the subduing of demonesses, which gained him the admiration of the people. I shall leave you to connect the rest of the dots yourself. Some may have already heard of ‘phallic symbols’ decorating the walls of Bhutanese houses, and models of phalluses lining shop shelves for tourists to buy. The monastery of the divine madman’s brother, blessed by the divine madman himself, is the final resting place of the main demoness the divine madman subjugated, and is also known as the temple of fertility. Married couples go to this monastery to pray for the blessing of children. The national sport of Bhutan, archery (which women do not participate in) also showcases these three values. When the man hits the target with his arrow (some targets are 150m away), female dancers perform a ritual song carrying jars of alcohol, another one of the divine madman’s values. Another way the divine madman stories really affect the Bhutanese people’s lives resides in the harshly steep slopes of the Himalayas of Eastern Bhutan. The Bhutanese young men, in the spirit of the ‘divine madman’, climb the walls of the houses of the girls they like, and break in through the windows, to chat and get to know the woman who lives inside. It is deeply rooted inside Bhutanese culture for the girl to consent to such things. It is difficult to see such things in our modern world. We have come a long way from pitting slaves against each other to fight to the death for entertainment, but it could still be argued that we have not come far enough. Subjugation of our fellow human is the snake that slithers through the whole timeline of human history, even now, and this trip to Bhutan let me catch a better glimpse of the scales of such a beast. I hope that in the future, we will finally see the whole body of this serpent, and prevent it from injecting its venom into civilization. So, the service aspect of the NYAA is finally starting up, and I’ve picked a local service to focus my efforts on this time. I’m really looking forward to working with them, so without further ado, here’s some information on why I picked my local service and my ambitions for the next year (perhaps even longer) in local service work! This term, I’ve signed up for the activity titled ‘Music Buddies with the Cerebral Palsy Alliance (CPAS)’, and every Monday we travel to the CPAS School to get to know kids our age with Cerebral Palsy. I won’t go too in-depth into the specifics of the disease, but I know that I originally picked this local service because I already love music and I’ve worked a lot with lots of different kinds of people and I wanted to try something new. However, nothing really went as planned and it turns out we’re helping out with ‘Life Skills’ class instead, but I think this type of action is a lot more meaningful and allows us to interact with the kids on a deeper level, helping them with aspects of their daily lives and really getting to know them as people. I feel like they process everything happening around them, but find it difficult to respond, and I find that really sad. I’ve been trying to interact with them, and it’s been really fulfilling because one girl, Rain, will reach out her hand for me to hold or clasp and the fact she’s making the effort to reach out to me really touches me because it gives me a sense of hope that maybe one day she can be more accepted in society, and hope that she’ll be able to build meaningful connections with others just like any human would. I’m still nervous about visiting the kids, but I sincerely hope that we have a positive impact on the kids’ lives. I want to work on observing them as much as I can, to learn more about them. I talked to one of the teacher facilitators as well, and he talked about how he was helping to ‘enable’ the kids, and how he was comfortable with them, which makes me realise that it actually is very difficult to get to know them at first, but I think that over time I should really be able to build a connection with them. Everything I’ve said so far is tying into my goal, which is “to make the cerebral palsy group feel more accepted by society through volunteering for them, communicating with them and building a relationship with them.” I chose this goal because I really want to focus on the idea of human connection here. I’d also like to continue thinking and working on the idea of Human Connection because I feel like the intricacies it contains may help me discover things about the inner workings of the human brain and also help me form better relationships not only with other people, but with myself as well. So, those were my hopes and first perceptions of CPAS, and I’m genuinely looking forward to exploring this topic more and doing more work for CPAS. Thanks for reading! This month in Masterclass we’ve been doing a lot of practicing our pieces. I’ve been finding it really challenging as I don’t know if I have enough time to fully master the piece before performing it. Practice is a really important thing for me as the more I practice, the more confident I will be in the performance and the better the performance will go. I’ve had multiple experiences with performing in the past where I wasn’t prepared enough, and that definitely really impacted my performance in a way I didn’t want it to, so I’m really worried about the piece I’m playing in March as perhaps it’s not prepared enough. I think acknowledging this is really helping me as I now fully realise the implications of not being able to practice enough. I think this will definitely help me manage future performances and practice schedules for that to help make me a lot less stressed about performing. I’m thinking about using google calendar to set up a practice schedule as well. I’ve also been doing some practice for the upcoming March performance in my ITP classes and also learning some theory and new pieces. I’ve been learning some new scales that perhaps I will be tested on, and I’m definitely gaining more control over my fingers and becoming more confident in playing. It’s been really enjoyable and de-stressing as I finally get to play pieces that I like (since I’m finally at that level) and I’ve genuinely enjoyed playing the piano this month. It’s been very relaxing. I’m nervous for the performance upcoming in March, but I vow to continue practicing hard until the performance to make sure I can give the best performance possible. After the long December break, it was difficult getting back into the swing of things, especially because this month I think that there were a lot of setbacks to working towards my goal. One of the first challenges I went through was having my piano exam for G6 canceled. I was looking forward to this exam as I thought that it would give me more experience dealing with stress, but it was canceled because I couldn’t register in time. Since it would be a long time before the next exam period, I moved onto G7. However, there were some good things that came out of this setback. Firstly, now I can start playing higher level pieces, including one of my favourite pieces of all time. I also realised that when I really love a piece, it’s a lot easier to play it in front of others, and I think that this can lessen performance stress. There will still be nerves, I know, but playing a piece I’m familiar with musically and also one that I really enjoy playing will help my performance anxiety. I’ve also started lots of new pieces, helping to build up my skill, and also new scales and techniques that will allow me to become more confident. I’ve learned that being less stressed goes hand in hand with practice, and the more I practice, the better I will get and the less nervous I will be. This month in Piano Masterclass, we watched a documentary on being a concert pianist. The documentary is linked here. What I found really disheartening about this documentary was the idea of natural talent, that talent is something fixed that cannot be changed, and since I already have really bad performance anxiety, I never thought that I could become a concert pianist. I don’t even know if I want to be. This is completely putting me off performing, and I realise how much I actually dislike performing in front of others, so much so that after I finish high school, I want piano to become a completely solitary thing for me. This just worsens my performance anxiety, because the people in the documentary didn’t seem all that nervous while performing, and it just made me feel more isolated. This stresses me out even more. However, one of the ways that I’m working on lessening my stress is actually perming in front of others and practicing in front of my family, and I know that I can continue pushing on because music is meant to be shared. Music is different for everyone, and this documentary also helped me realise that. Music continues to de-stress me, and watching one documentary isn’t going to change that. This month was a difficult month, but I know that I can push through it and continue working towards my goal. I’m learning lots of new pieces, and have a performance coming up in March to look forward to. In this emotional rollercoaster of a talk, Martin Suarez retells the heart-wrenching stories of two of his students, who he met when he was doing volunteer work as a teacher in a maximum security prison in Argentina. Gaby and German had come from entirely different backgrounds. Gaby had grown up with an abusive father, and at the age of 13, fatally struck his father and ran into the streets with his mother. It was inevitable for him to enter a life of crime, he had no choice in the matter. German, however, was an educated and artistic man, whose family supported him when he made an awful mistake and went to prison. Both men attended Suarez’s lessons, and were ‘strong leaders’, as Suarez puts it. They had not only physical strength, but mental strength as well. Suarez talks of how Gaby would teach others to read and write, and how German would carry people to classes so that they could learn, and would paint pictures for the orphans. Gaby even studied law while in prison, and had completed 90% of the work to obtain a degree. However, both men had reached different endings. Suarez suspects that Gaby has gone back into crime, while German got a job due to a feat of kindness and his skilled hands, and tends to an old man’s machinery. Suarez was first motivated to volunteer when he witnessed a prison maths class. He “saw human beings just like [him]”, loving and respecting a teacher in the name of education. Suarez realised that these juvenile-yet-not-juvenile people had just been the victim of ignorance, whether that be from stupidly making a mistake that landed them in prison, or growing up like Gaby, without the education or the means to bring themselves out of the never-ending cycle of pain they were born into. But Suarez also realised, that “education is so powerful”, and is an door that leads to a whole new hallway, with even more doors, for you to explore and learn, and this is how we stop ignorance. 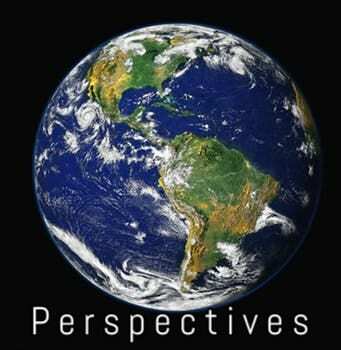 This is how we stop the problems that we have in this world, by educating ourselves to rid our prejudices, and realise that everyone deserves a second chance, or a third, or a fourth. We are all made up of the same things, after all. So we must ask ourselves, “What can I do for others from here?” (German), and realise that, “The past was destined, the present is inevitable, but the future is up to me.” (Gaby). Al Hornsby is one of the lucky people in this world who is doing something he genuinely enjoys, and is doing good by it. His job is no easy task, but Hornsby has been diving in the deep sea since he was 12, and since then, has seen many of the wonders of the underwater world, photographing them and publishing ‘encounter stories’ in various magazines. He’s photographed animals ranging from the biggest whale fights, down to the tiniest pregnant pygmy seahorse, from the deadly sharks, to the slow-moving turtles. But he doesn’t just work in the sea. He’s taken photos of wild mountain goats grazing on mountainside grass, and grizzly bears with deep, dark eyes, plodding through the long grass, and many, many other beautiful creatures. But Hornsby tells us of how fragile the earth is, how ecosystems hang precariously in balance, and how important it is to realise our impact on that balance and watch how we’re affecting the earth. Hornsby gives many examples of how nature could fall out of balance, one of which being lions not weeding out the weaker, sicker antelopes, so all the grass gets eaten and in the end, everything dies. He speaks of defending that precious stability, because it’s what gives so much beauty to the earth. So, he photographs and writes enchanting stories about the animals he’s met, and the places he’s been. “There’s a power in writing,” Hornsby says. It gives you the power the shape someone’s feelings and opinions, so to write, you must always take into account your audience. In fact, as Hornsby encounters an animal, he is already forming a story in his head, and when he begins to type, the world flow out of his fingertips faster than he can read them. Surprisingly, Hornsby has never really felt endangered from being near an animal. “They’re curious but accepting,” Hornsby says. If you respect your surroundings and the organisms within, then they will accept you, no questions asked. Hornsby tries to convey this in his writing, to explain the natural beauty of nature and how important it is. This realisation of the beauty that nature holds was one of the many takeaways for me in this talk. I’ve realised how unlikely it is for our planet to have such systems of life, and how amazing it is that evolution can create something as complex and interesting as an ecosystem. Our planet is remarkably intricate, every last animal fitting into its place on the food chain. This is why it’s so important to protect our environment and respect the earth, because not only is it our home, it’s also a source of beauty and happiness, and can teach us more than we could ever imagine. Sanjay Perera’s talk on the ‘best fight [he] never had’ was full of witty comments, hilarious one-liners and detailed descriptions, and was funny, insightful, but most of all, very surprising. And to his and my surprise, this great, beast of a man’s friends began to laugh. “They saw me as a human being for a second,” Perera said, as the tension suddenly evaporated. It was completely bizarre. Within this experience, Perera sensed a deep injustice, and realised that this was one of the rare moments illustrating perfectly the idea of ‘some people will hate you for things you can’t control’, which Perera himself expressed. However, the really surprising thing for me about this story was how quickly people could overcome their prejudices, even for a second, to share a moment of laughter with another person. Even if the connection lasted only a second, it was there, and this gives me faith that anyone can change how they think about someone else. Perhaps on the first impression, people will dislike you for something you have no control over, but as time passes, maybe their opinion of you could change. This story taught me the importance of seeing others as human beings, not as white, or black, or brown. To see without colour is something all children are born with, and lose as they grow up, but perhaps it is important to preserve that innocence and willingness to accept people in any shape or form, so that in the future, all of us will have a safe world to live in and express ourselves in. How does religion affect the Bhutanese people's daily lives?